With the end of 2010 fast approaching, I thought it would be fun to reflect on our collecting achievements over the last year, while also establishing some goals for 2011. When next year comes to a close, we can drag out this post and see how we did. Ready? Then here we go! Will they happen? Who knows... We'll see how 2011 unfolds. At the end of the year, when we return to this list, I'm looking forward to seeing how many goals I'll be able to reclassify as achievements. I'd like to give a shout out to sculptor Andy Hill, who has three of his Andy Bots included in an exhibit called "The Art of the Robot" at the Mulvane Art Museum in Topeka, Kansas. Photo: Curator Carol Emert for the Mulvane Art Museum. Via Alphadrome. Andy is a talented artist who creates fascinating toy robots out of found objects. His pieces are always fun and full of personality, and wrought with such skill that you can rarely tell where the individual parts originally came from. I've written about him, and have posted pics of my own Andy Bots, here. "The Art of the Robot" runs through September 19, and includes works by 17 artists, including Hill, Clayton Bailey, Eric Joyner, Nemo Gould, and David Lipson. 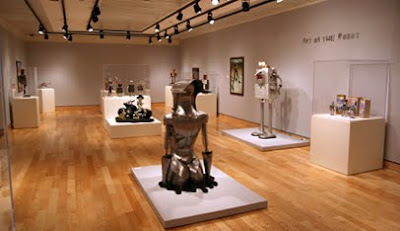 For more information, visit the Mulvane Art Museum's web site. You can find out more about Andy Hill's work by visiting his site, Electro Art Works. I've added a few new robots to my collection lately, and frankly, the cases are starting to feel a bit cluttered. Time for some re-arranging! I enjoy figuring out new ways to display my toys. It's a chance to interact with the collection, to pull down all the robots and really get a feel for them after what's often been quite a long time. When I've finished, the collection feels brand new; I get overly comfortable seeing the toys in the same place day in and day out, and sometimes they end up becoming background noise. By shaking things up, I really find myself focusing on these toys in a brand new way. What about you guys? How often do you re-arrange your collections? Is it a fun process? A painful one? What sort of criteria do you use when deciding how to arrange your stuff? Leave any thoughts in the comments section.